CTDUT is a technology center specialized in pipelines and terminals. Its activities started in 2006 in a partnership between Petrobras, Transpetro and the Pontifical Catholic University of Rio de Janeiro (PUC-RJ), as a shared laboratory for the use of the pipeline community. It is a non-profit private association open for use by any company or institution. CTDUT was funded by the Oil & Gas Department Fund (CTPetro), associated to Science and Technology Ministry, trough FINEP (Financier of Studies and Projects) and ANP (National Agency of Oil, Natural Gas and Biofuels). The Center has, among its associates, companies, universities, educational & research institutions and representative organizations of the industry. Provide technological solutions for the pipeline transport sector in articulation with companies, third sector, private sector, universities and other institutions that work in the pipeline and terminal area, contributing to the competitiveness of the Brazilian industry in the sector and to the safety of this activity in guarantee of preservation of the environment. To be recognized as a reference technological center to attend the demands of the pipeline’s community. To be a pole of integration between companies, universities and research centers, aiming the strengthening and improvement of the competitiveness of the national and international pipeline transportation goods and services industry. Provide real-scale laboratory facilities for the ductwork market in order to test, evaluate and certify products, equipment and procedures used in pipelines mesh. To train, enable and certify people. To advise technically people who work or have researches focused on the pipeline sector. Research and develop new techniques and technologies. Promote, support and encourage the initiatives of universities and institutions dedicated to R & D applied in the pipeline area. Encourage and publicize the creation of new technology-based companies for the pipeline market. To create and keep up to date an information system built on databases about pipelines and pipeline systems, which serves the industrial sector, government agencies, development agencies and technological and university centers. To motivate and promote the creation of new companies based on technology in the area their performance. The CTDUT is located in Brazil, in the state of Rio de Janeiro, in the district of Campos Elíseos in Duque de Caxias, in an industrial area linked to the oil and gas sector. Do not use GPS. Print the map. In the Waze app, search the name CTDUT. 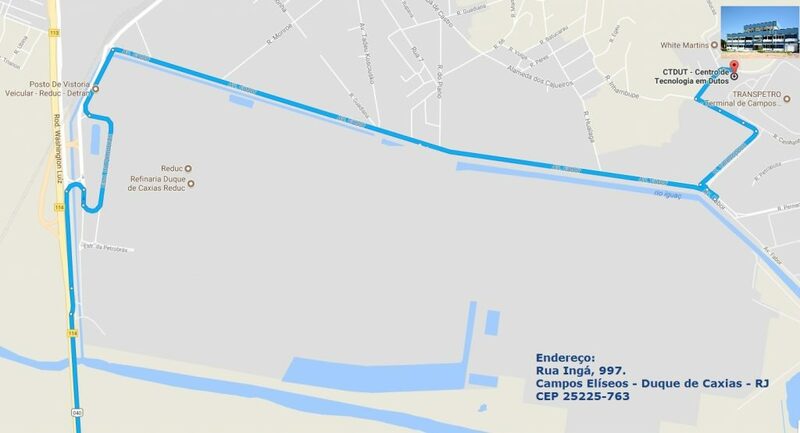 It shows the way for CTDUT using the conventional route that necessarily indicates to pass the front door of the Duque de CaxiasRefinery and the Detran of Campos Elíseos, Fabor Avenue and in front of Termo Rio (Governador Leonel Brizola Thermoelectric at Teresópolis Street). If it is not the route the app shows, use the map above in order to avoid entering nearby risk areas. We do not advise you to use the CTDUT address on the GPS. Print the map by clicking the link below.